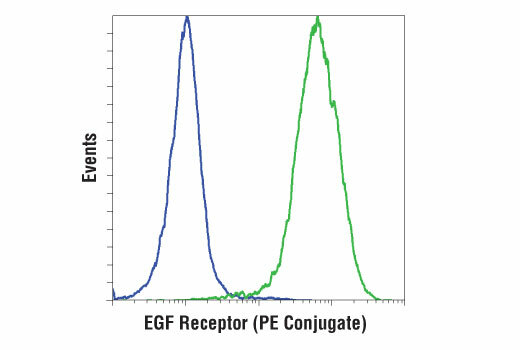 Flow cytometric analysis of fixed and unpermeabilized CAMA-1 cells (blue) and A-431 cells (green) using EGF Receptor (D1D4J) XP® Rabbit mAb (Neutralizing) (PE Conjugate). EGF Receptor (D1D4J) XP® Rabbit mAb (Neutralizing) (PE Conjugate) recognizes endogenous levels of total EGFR protein. Monoclonal antibody is produced by immunizing animals with mammalian cells expressing full length EGF receptor protein. This Cell Signaling Technology antibody is conjugated to phycoerythrin (PE) and tested in-house for direct flow cytometry analysis in human cells. This antibody is expected to exhibit the same species cross-reactivity as the unconjugated EGFR (D1D4J) XP® Rabbit mAb (Neutralizing) #54359.